Neil and I have had the same bed in our master bedroom since we got married SEVEN years ago!! Moving into a new house definitely had us feeling that seven year itch and totally ready to makeover our space. So today we're sharing with you a little master bedroom makeover we did in our new house to refresh the space and make everything feel a little more like home. When we first got married we saved all our pennies and bought our very first bed frame at a Pottery Barn seconds sale. 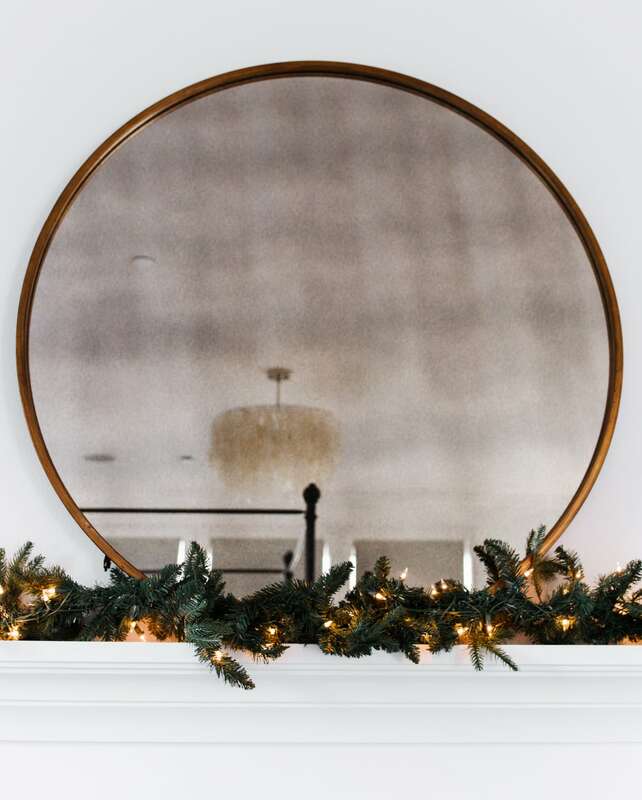 We loved it so much that when we moved into our first home in California we spray painted it gold to give it a little update it so we could hang on to it for a little longer. It looked so good in our old house, but in our new house it definitely felt a little too small to fill out the room, and the spray paint was starting to rub off everywhere haha. So it was definitely time for something new! I'm SO HAPPY with how it turned out!! We kept our same lamps and night stand dressers for now but eventually I'll probably swap those out too for something mid-century modern. While the layout of the Master in our new home is pretty much the same as our old Master (SCORE!) it is a much larger space. All the extra space made our big, beautiful, beloved bed look like doll furniture! 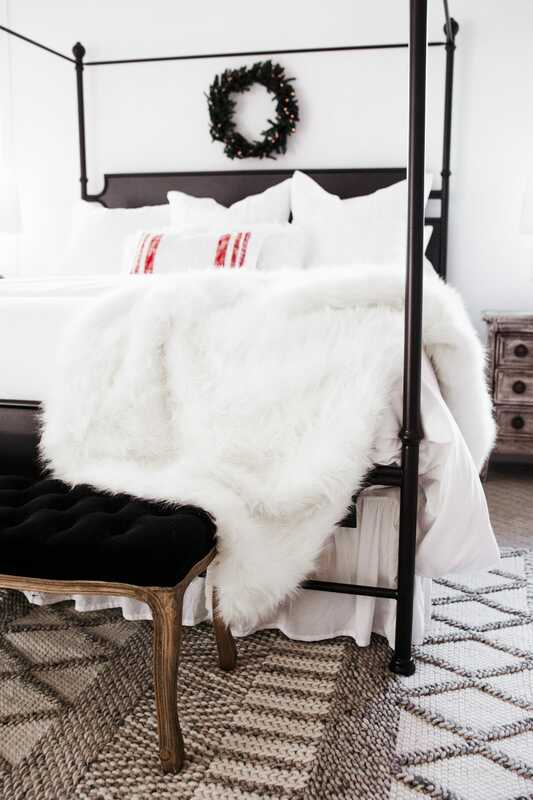 This canopy bed from Hayneedle was perfect for filling the space and BONUS it was super affordable! California King bedframes can be spendy and this one is UNDER $700. 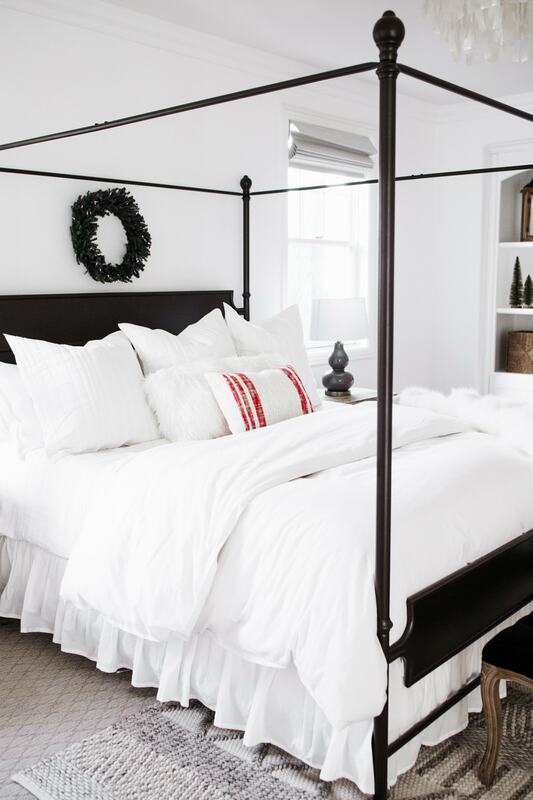 I really love this gorgeous, simple bedding from West Elm. 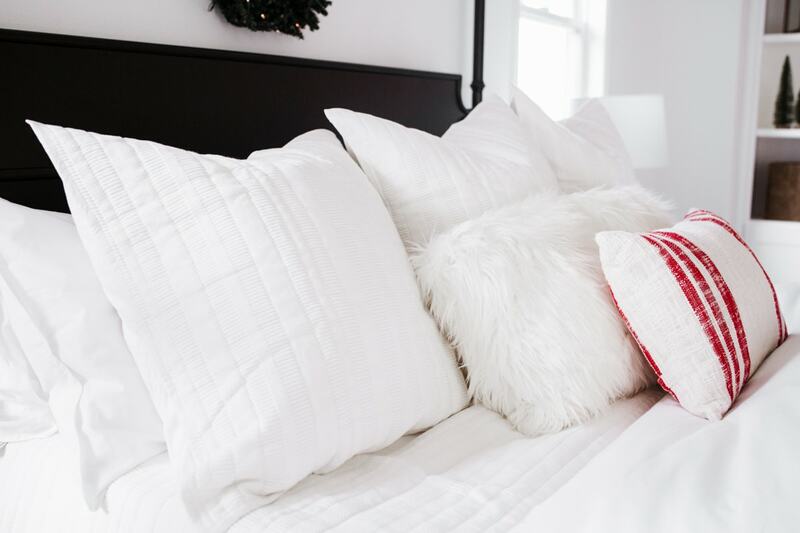 You guys know white bedding is my jam and all the clean lines on this bedding totally spoke to my soul! 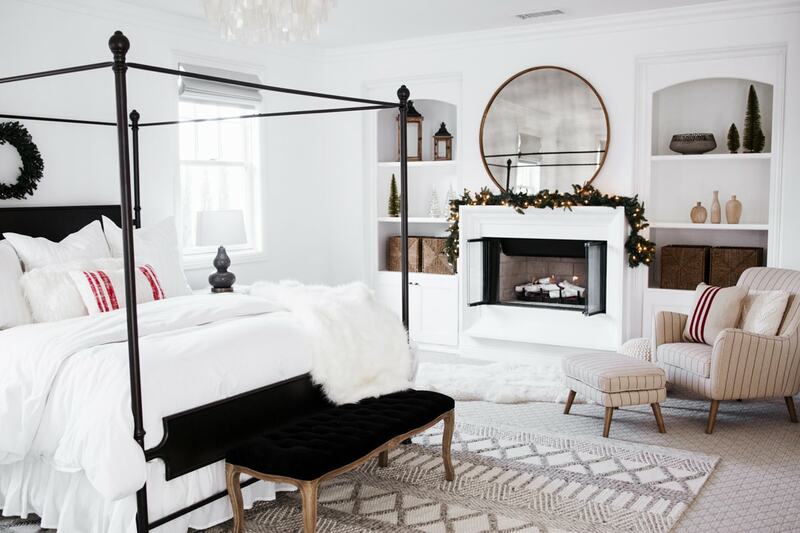 Three cheers for Master bedroom fireplaces! Who knew these were so amazing? This cozy striped chair is currently my favorite place to sit and feed Millie. 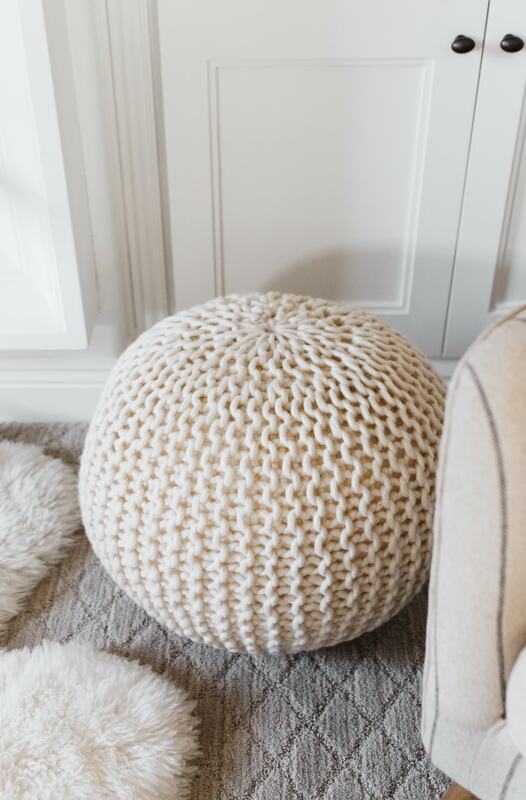 The girls love coming in and sitting on this cozy little pouf and hanging out. The light fixture previously hanging in our Master was horrible. Like wake up every day and look at the ceiling and go “why am I still looking at this thing? 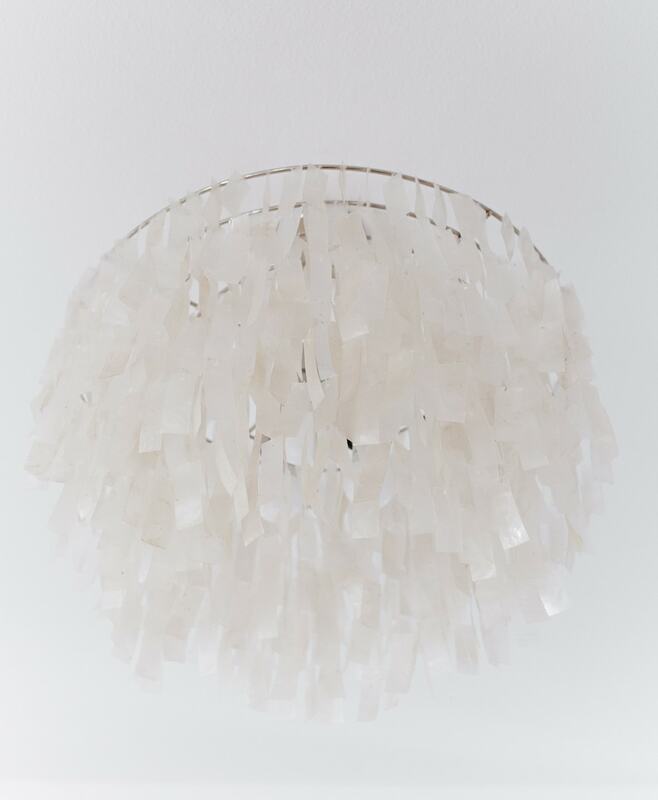 !” This shell chandelier was totally love at first site and I absolutely adore the way that it looks in the space. It diffuses the light in the most beautiful, romantic way (and it's currently 25% off)!! An indoor area rug is also great for breaking up a large space. This one is such a beautiful neutral and so soft. 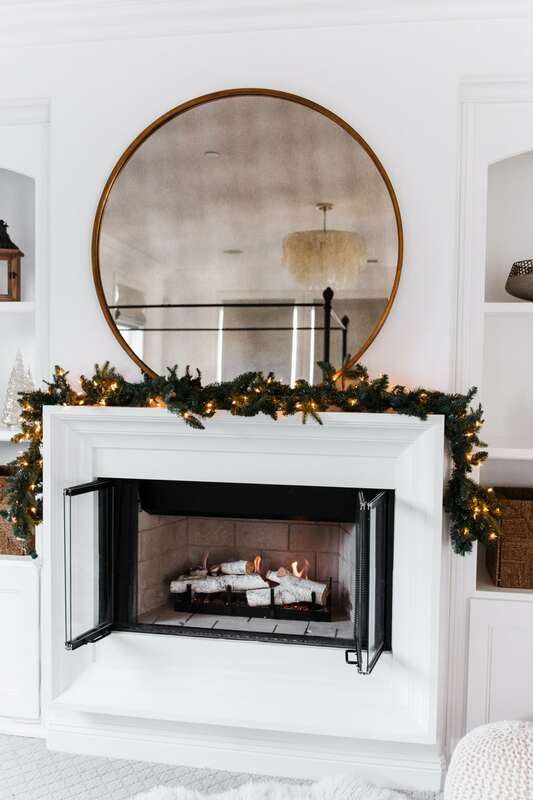 If you saw our small family room and kitchen updates you know I love swapping out accessories and knickknacks out around different trends and seasons so I HAD to bring a little Christmas into the space! 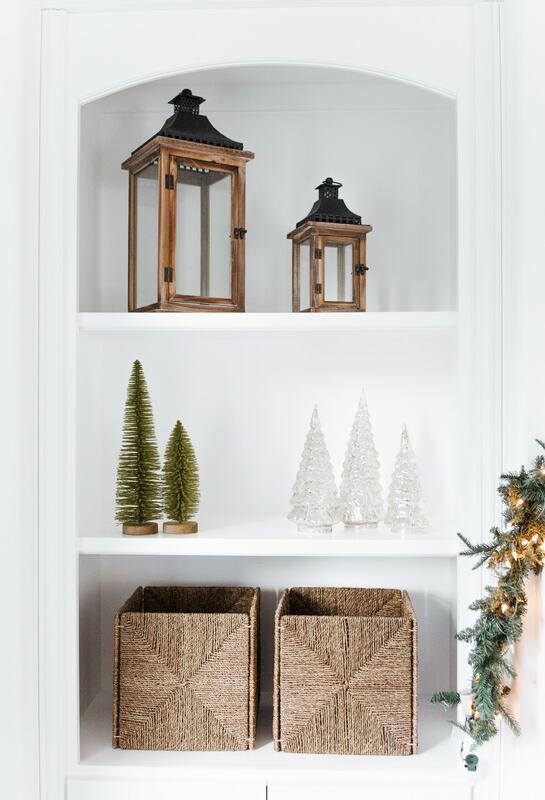 They're such simple little touches, but it feels so homey for the holidays! I'm always very overwhelmed though when it comes to a ton of space to fill in built-ins, so I worked with my friend Tahni (who also helped with our kitchen and Millie's nursery!) 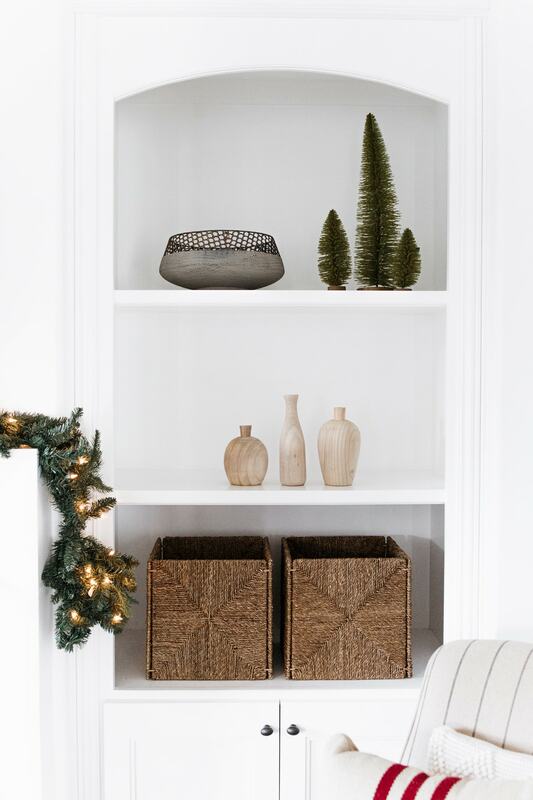 to bring everything together in this room. 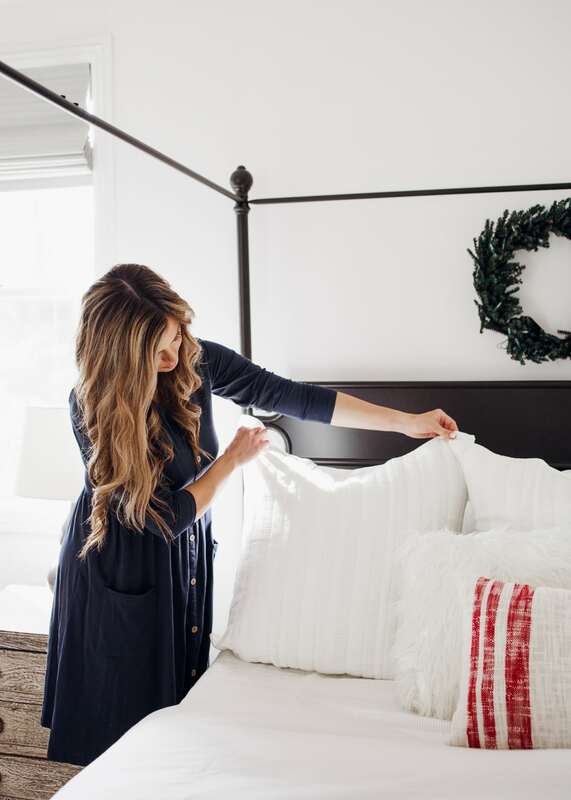 I absolutely love the impact these small and super affordable changes had on filling and refreshing our Master bedroom! It's so nice to have a room that feels peaceful and complete when I walk in at the end of a long day. I was looking at using this bed for a client’s BnB but we want something that is super sturdy. It obviously looks amazing but can you comment on how sturdy it feels? Is this bed the bronze color? It looks black but Hayneedle said they never carried in black? Is that a California King pictured? Hey Jill, so sorry about the confusion. The bed definitely looks black in person but I think when we ordered it we selected “bronze” (kind of like oil rubbed bronze, a dark bronze?) haha I don’t know if that’s even helpful, but I do vaguely remember it being called something other than just black. Hope that helps! 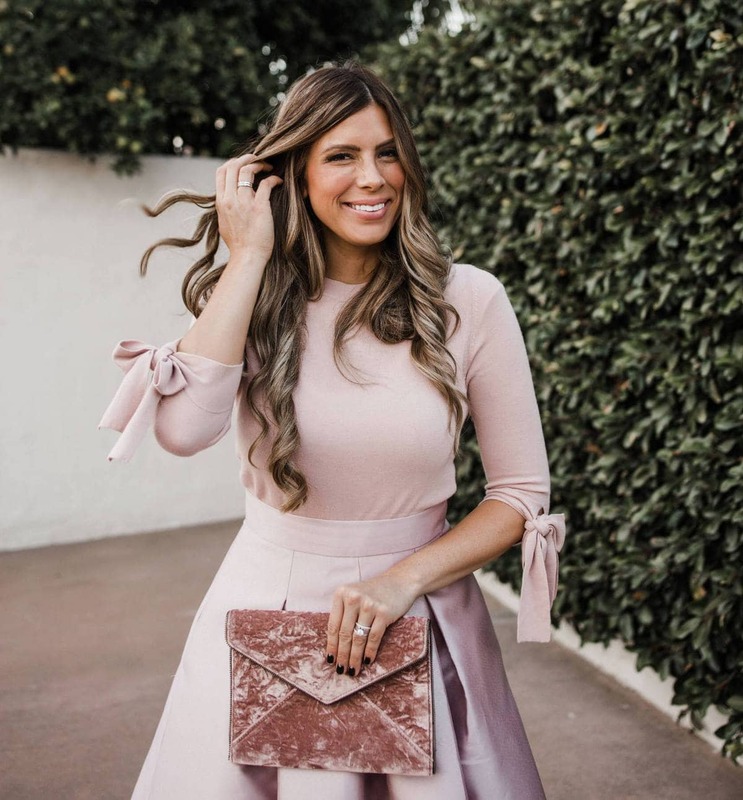 Three TOP RATED closet staples that you’ll wear over and over this winter!! !